The difference between (1) and (2) is intonational: (1) has a final rise--indicated by the question mark--while (2) ends with a fall. 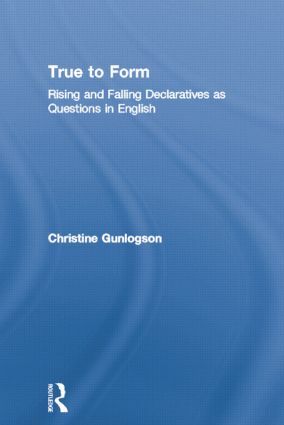 Christine Gunlogson's central claim is that the meaning and use of both kinds of sentences must be understood in terms of the meaning of their defining formal elements, namely declarative sentence type and rising versus falling intonation. Gunlogson supports that claim through an investigation of the use of declaratives as questions. On one hand, Gunlogson demonstrates that rising and falling declaratives share an aspect of conventional meaning attributable to their declarative form, distinguishing them both from the corresponding polar interrogative (Is it raining?) and constraining their use as questions. On the other hand, since (1) and (2) constitute a minimal pair, differing only in intonation, systematic differences in character and function between them--in particular, the relative "naturalness" of (1) as a question compared to (2) --must be located in the contrast between the fall and the rise. To account for these two sets of differences, Gunlogson gives a compositional account of rising and falling declaratives under which declarative form expresses commitment to the propositional content of the declarative. Rising versus falling intonation on declaratives is responsible for attribution of the commitment to the Addressee versus the Speaker, respectively. The result is an inherent contextual "bias" associated with declaratives, which constitutes the crucial point of difference with interrogatives. The compositional analysis is implemented in the framework of context update semantics (Heim 1982 and others), using an articulated version of the Common Ground (Stalnaker 1978) that distinguishes the commitments of the individual discourse participants. Restrictions on the use of declaratives as questions, as well as differences between rising and falling declaratives as questions, are shown to follow from this account. Gunlogson argues that neither rising nor falling declaratives are inherently questioning--rather, the questioning function of declaratives arises through the interaction of sentence type, intonation, and context.